The trotters are in behind the gate, and heeeeeere they come! A field of three horses trots up behind the moving starting gate at McGhees’ Mile on Banks Mill Road in Aiken. This is the eighth and featured race of the day, the Ken Hardin Memorial, and these horses know their jobs. The earlier races had mostly green 2-year-olds, and few of the other horses racing today have ever made an official start. The horses for this race, by contrast, range in age from 3 to 7 and have raced anywhere from seven to 40 times. The greener horses were pulling slower jog carts. These horses are hitched to sulkies, commonly referred to as race bikes. “Things are gonna get serious!” promises the announcer, Roger Huston, as the gate car pulls away and the horses start trotting in earnest. He is right – the horses fly over the red clay as Huston calls off the fractions: opening quarter 29 and 4, (“I told you they were gonna get serious); the half at one minute flat (“They’re even getting more serious,”) three quarters at 1:31 and one fifth. “Into the stretch they come . . there’s no doubt about this one . . . Flashy Cash showing his heels to the field!” The final time, two minutes and three fifths of a second, isn’t any kind of record, but is certainly respectable for horses at an unofficial training track in South Carolina. 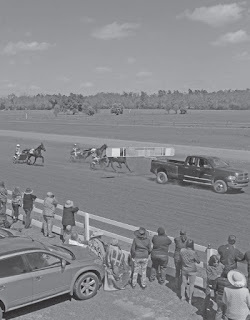 This day, March 28, marks the comeback of the McGhees’ Mile Standardbred races, which were once an annual tradition. 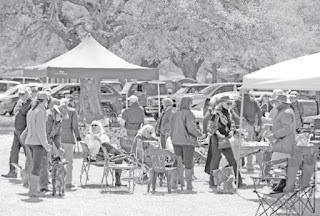 Originally, the races were the third event of the Aiken Triple Crown, three consecutive Saturdays of horse sports that include the Aiken Trials for young Thoroughbreds and the Aiken Spring Steeplechase, which is an official race meet on the National Steeplechase Association calendar. But there have not been enough Standardbreds at the track in recent years to hold the races here, and so the Pacers and Polo match took over as the third leg of the Triple Crown back in 2004. 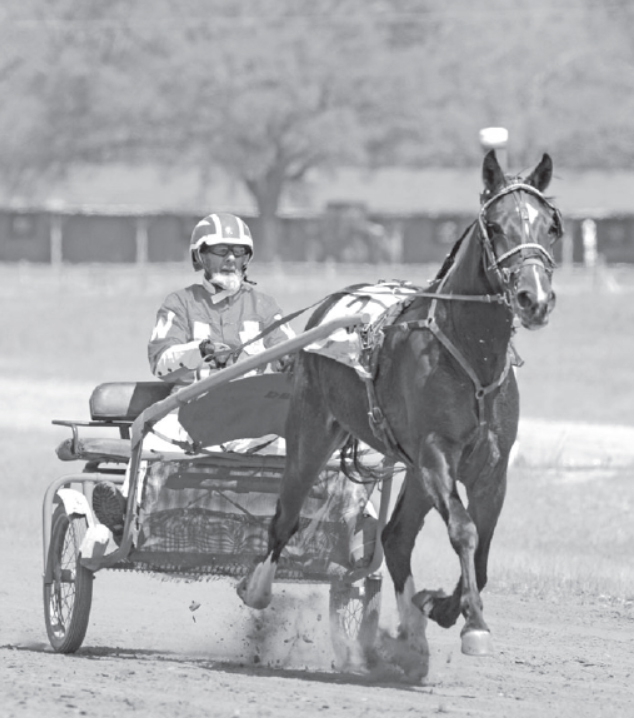 Although the polo match retains its place in the Triple Crown, the harness horses have returned, and it looks as though they are here to stay. “We’re happy,” says Janis McGhee, who owns the track along with her husband Bruce. Janis estimates that as many as 1,200 people came out to picnic railside and cheer on the horses and drivers. “It’s more people than what I expected this time,” she continues. “My kids and I put a lot of work into this . . I really have to give credit to the kids. They worked from morning until night. If it wasn’t for them we couldn’t have done it.” The McGhee sons, Bruce and Matt, also enlisted their girlfriends to help. One daughter, Jessica, who is in veterinary school, came down to help out on the weekends along with her son. It was a family event from start to finish. Although the races have an informal atmosphere, there is nothing amateurish about them. 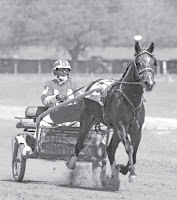 The drivers and trainers are professionals, and include Kenny Edwards, who races and trains in Ohio. This is the second winter that Edwards and his family have come to train in Aiken for the winter. His wife, Beatrice, says they came to Aiken for the mild weather, and so that Kenny wouldn’t be tempted to race in Ohio through the bitter cold months. “If we weren’t here, he’d be racing at Northfield Park right now, where it’s snowing,” she says. The announcer, Roger Huston, is among the most well-known professional race announcers anywhere. He normally announces at the Meadows in Pennsylvania. Every September, he is the voice of the Little Brown Jug in Delaware County, Ohio, a pacer’s equivalent of the Kentucky Derby. Huston, who is known simply as “The Voice”, has been announcing for 56 years. 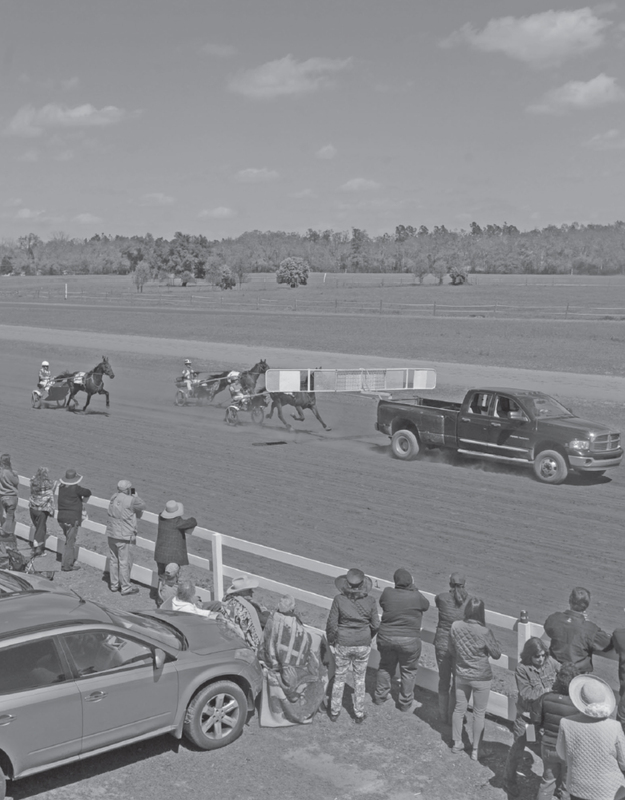 The races are a success by every measure, and if this day is any indication, harness racing is coming back as one of Aiken’s equestrian disciplines. Spectators certainly enjoyed themselves. “This is exciting, it’s wonderful,” says one spectator, Elliott Levy, who is the former director of the Aiken County Historical Museum. “It’s something that really belongs in Aiken and it demonstrates the diversity of the equine community here. 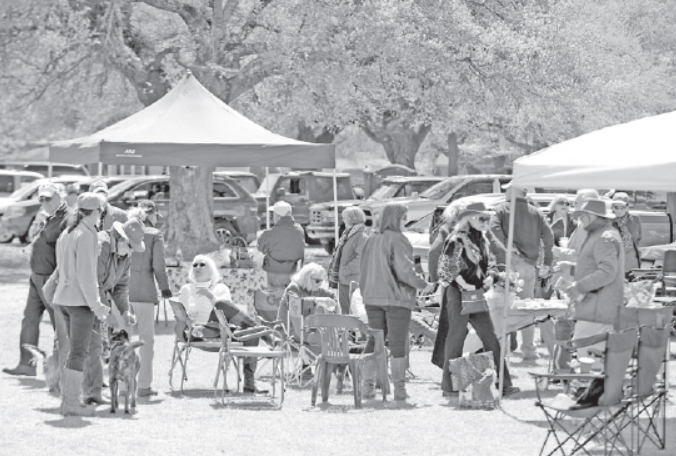 It’s another element that makes Aiken so unique.” Elliot points out that there are two other equestrian events going on today, Pacers and Polo and the Aiken Horse Show in the Woods.